If you have a family and enjoy travelling the world together, perhaps you are looking for a bit of inspiration on where to head to next, or travel tips to make your lives a little bit easier. Travel blogs are fantastic resources for all of your wanderlust needs, and we’ve gathered together 30 of our favourites that are family friendly! Follow the journey of Alyson, James, D and Boo, a family who have been travelling together since 2012. As with many travel bloggers, travelling is now their full-time job! The children are homeschooled while visiting incredible destinations, which sounds like a great way to grow up! Global Mouse Travels is a UK based travel blog which covers both adventures around the world, and trips within the UK, making for a great and varied collection of inspiration! They even post recipes inspired by their travels, which we love! If you want plenty of tips for travelling with kids, you’ve come to the right place. Here you will find a wealth of super useful information on topics such as vaccinations, travelling while pregnant, and what to pack for a cruise, all amongst tales of fantastic trips! Charly who runs POD Travels is a Surrey based travel blogger, and her blog follows her and her family as they globe trot and explore. From the Caribbean to South East Asia or Australia, you’ll have plenty of great trips to read about! Mini travellers is a great mix of destination reviews, days out, and holiday ideas. There’s even a section on family-friendly festivals! As the name suggests, this blog is run by a UK based family, who hail from the North East. Fantastic if you also live in the area and want to know what’s on, or great days out, but also a brilliant read for their worldwide travels too! Be inspired by the travels of Claire and her family around Europe and the UK and give Tin Box Traveller a follow! From what to see and do, to trips that didn’t go quite so well, you’ll gain lots of insight if you’re planning to travel as a family yourself. This family from London share tips on how to travel as a family, as well as plenty of posts about London itself and what’s on in the capital. A great blog to follow whether you want to read about glamping in Wales or a trip to the Norwegian fjords alike! This family of three aim to prove that it isn’t impossible at all to travel with children, and inspire other families to follow in their footsteps to explore distant lands as well as local sights! With guides to moving abroad, tips for flying and travelling by train, and plenty of inspiring trips to read about, this is a great blog to follow. The Holland family are from East Sussex and love a good adventure! From local days out to travels overseas, they share their travels via their blog Juggling On Rollerskates. Oh, and you’ll also find posts about food and plenty of handy tips! The mama of all family travel blogs (excuse the pun), Travel Mamas was founded by Colleen Lanin, and now boasts a team from all over the world blogging about travel, tips, packing lists, and stories of travelling with little ones in tow! Zena is a mother of three who is here to share with us that travelling with children isn’t actually as hard as you may think it is! For brilliant tips on how to make such travels go as smoothly as possible, what to pack, and tales of adventure, you’ll love hearing about her family trips. From Mykonos to Hong Kong, Elizabeth Callaghan aka Wander Mum has been to many wonderful parts of the world. Falling in love with travel while backpacking in her 20s, she now travels with her family, and they are absolutely making the most of life following her husband surviving life threatening illness! Inspiring. The wonderfully titled Extraordinary Chaos is a blog run by Sarah, a mother and wife to an adventurous family. From ways to save money at Disney to food and interiors post, this great blog has a little of everything. Susanna who runs A Modern Mother is also the founder of the BritMums network of bloggers, and has become something of an authority in the blogosphere! Follow along as she brings her family along on adventures, both abroad and closer to home. 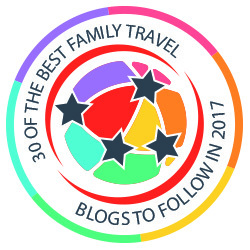 When compiling a list of the best family travel blogs, it would be impossible to exclude one literally titled ‘Travel Loving Family’ wouldn’t it? The blog itself is run by Lisa, editor of Trips100, and is brilliant. Whether you’re looking for destination guides, insider tips on things to do locally, or packing lists, you’ll find it all here! Project Wanderlust was established in 2015 and focuses on inspiring but affordable family travel. We certainly feel inspired by the adventures of Alice and her family as they follow their hearts all over the world! Katy and Mr S and their three children love going on road trips, and believe that life is an adventure, a sentiment we are certainly on board with! Otis is the name of their campervan, which they lovingly restored over three years and now carries them around near and far. If you have babies or toddlers, Kiddie Holidays is well worth a follow. Jo who runs the blog provides a wealth of advice when it comes to family friendly holidays and days out if you have babies and toddlers in tow, and plenty of practical tips too. This family travel blog may well be the ultimate guide to family travel, as the tagline on the blog suggests! Carrie who runs the blog used to be a flight attendant, and has visited over 60 countries! Her inside knowledge is a huge help for parents who have caught the travel bug seeking inspiration. Potentially the only Muslim family currently blogging about travel, Five Adventures follows Nisbah and her husband Doc as they show their children the world! A brilliant resource for those wishing for travel tips from an Islamic perspective, you can even find out the best places to head for halal afternoon tea! From advice on surviving a road trip with kids to honest reviews of hotels and campsites, you’ll find plenty of great family travel tips on Daisy Huntington’s blog Dais Like These! She also has a lovely dog, so this is a great one to follow if you’re looking for advice on dog-friendly holidays or days out! The focus of this blog is taking the time to enjoy new experiences, and you will find city guides, travel tips, and plenty of experiences to inspire you. Clare who runs the blog loves looking for hidden gems, and you’ll find plenty if you give Suitcases and Sandcastles a follow. Jane is mother to three boys, and an established figure in the travel blogosphere. Showcasing the best events and outings in Portishead, where she lives, and nearby Bristol, as well as travels further afield and plenty of theatre reviews! Space In Your Case is co-edited by Penny, Katie, Helen, and Alison, and is a travel site for parents. Whether you’re after inspiration for a great family holiday, or you need to give yourself a child-free break, you’ve come to the right place. This blog is unique in that it is written by the whole family! The Ebners write about their days out, holidays abroad, and adventures, and it’s rather refreshing to hear about such travels from the children’s perspective. Laura Hitchcock runs Have Kids, Can Travel with help from her family! Her husband Courtenay is in charge of photography, and together they have four children, making quite the team. The children are home-schooled, meaning hey can head off on a new adventure to share with us at any time! Helen Wills started this blog as a diary for her daughter GG, and originally blogged in her daughter’s voice! The family also consists of The Bug, and Actually Daddy. You can find parenting tips, travel diaries, and activities on the blog. Kate Sutton who runs We Blog Travel started it as a travel focused addition to her already established blog WitWitWoo. She focuses mostly on luxurious travel, family holidays which are great for older children, and some solo travel. Before Alison became a mother, she was something of a mini break expert, with friends regularly picking her brains for advice. Now that she has a family, she is also an expert on family friendly holidays, and having a break with friends! She also posts lifestyle and style posts. We hope this has given you some inspiration if you’re looking for new family travel tips and inspiration, and don’t forget to check out our previous blog posts for plenty more travel advice.